Is it just bad posture or a sign of underlying structural problems? Maybe you heard these words as a child: “Stand up straight” or “Don’t slouch!” Your parents were always on you about your posture! I’m sure as a child you thought; “what’s the big deal!” Well, actually posture is a big deal regarding your health. As we age, many individuals assume that it is normal for our posture to become worse. We see the little ol’ lady or man walking hunched forward and wonder when we will become like this. Yet what most do not realize is that poor posture is not normal AND it can contribute to health issues like: arthritis, disc and joint degeneration, pinched nerves, pain or numbness in the arms or legs and a host of back issues. Poor posture is a problem. When viewing from the side, normal post ure would be that “standing up straight” or military attention position. If you were to draw a plumb line, it would go through the ear lobe, tip of the shoulder, center of the hip and knee and just in front of the ankle joint. Viewing from front or behind, our head should be level, as well as shoulders and hips level. Any deviation from these norms is an indication of postural distortions and could be the cause or associated with underlying health issues. In general, there are two syndromes that are related to what seems to be poor posture. They include: The Forward Head Syndrome and Upper Cross Syndrome. This syndrome can appear by itself or in association with other problems. Basically, forward head syndrome is noted when the head is carried in a forward position from the shoulders. This is easily noted when viewing from the side, the ear is in front of the shoulder. The average head weighs about 8-10 pounds. 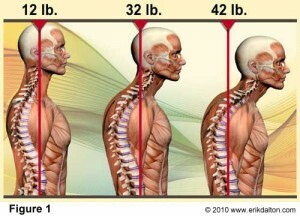 With normal posture, it feels as if the head weighs almost nothing because it is balanced on the neck. However, when the head begins to move forward, it increases the effect on the spine. In fact, for every inch it moves forward, it has the affect of doubling the weight on the neck. This is due to gravity pulling and the stress and tension placed on the neck. The effects of forward head postures are long-term. They may result in muscle strain, disc herniation/s, nerve impingement and the early onset of arthritis. Forward head posture is strongly linked to decreased respiratory muscle strength and breathing ability. Resulting in up to a 30% loss in vital capacity in the lungs as well as a significant increase in cardiac and vascular pressure. For every inch of forward head posture, it is found to increase the weight of the head on the spine by an additional 10 pounds. On average, this is over a 100% increase of weight bearing stress on the spine and it’s associated neuro-muscular structures. A Loss of the cervical spinal curve, due to forward head posture, can stretch the spinal cord up to 5-7cm resulting in adverse neural tension. Subsequently causing additional tension of the meninges (lining around the spinal cord) producing additional pressure on the brain-stem leading to increased compression and disruption of basic metabolic control functions and diseases. Forward head posture results in an increase in discomfort and pain, due to disrupted proprioceptive and sensory input from the first four cervical vertebrae. Forward head posture results in an anterior translation of the body’s center of gravity. This in turn results in a significant loss of balance and coordination, and increased likelihood of sustaining a fall. Forward head syndrome is not just poor posture, but it could be the cause of various pain syndromes including: headaches, migraines, neck pain, numbness or tingling in arms or hands and even contribute to carpal tunnel type pain. Have some body assist you in performing this simple home check. Stand up straight, take a deep breath, close your eyes and just relax into your “normal” standing posture. Now without moving, have someone look at you from the side: is your ear in line with your shoulder or in front of it: If so, how far? If your head is forward, you may have forward head syndrome. Call our office today to schedule an exam to determine the severity of your forward head and if it is causing other health issues. Call (314) 731-4383 to schedule a more thorough examination. Another more involved postural problem is called the upper cross syndrome: many times this includes the forward head syndrome. However, it is much more progressed and involves many of the muscles of the upper back and chest area. The upper cross syndrome has also been called the “Corporate or student syndrome” and is a pattern of muscle imbalance that develops from repetitive poor posture. In short, we adapt to our body position. The most common complaint of those experiencing upper cross syndrome is a tight upper trapezius muscle group (the muscle that runs from top of the shoulder blade to the base of the skull). This is common in society today. Typically, those affected the most by the upper cross syndrome are individuals who sit most of the day, usually at a desk or in front of a computer: Hence, the corporate or student syndrome. Unfortunately, when individuals are involved in their work, they do not pay attention to correct working posture. In this case, many people find themselves leaning forward, hunched over a desk or holding their arms and shoulders tight. Maintaining this posture for hours a day on a regular basis causes muscle imbalance in the upper body, various muscles of the upper chest and neck become out of balance with the upper back and neck muscles. The longer this imbalance persists, the more likely it is that the individual will develop biomechanical issue regarding the joint mobility in the spinal joints of the neck, scapula (shoulder blade) and shoulder. Persistent mobility issues can result in such pain causing problems as: inflammation, pinched nerves, shoulder impingement syndrome, rotator cuff problems, mid back pain, pain or numbness in the arms or hands, trigger points in the trapezius muscles and many other problems. 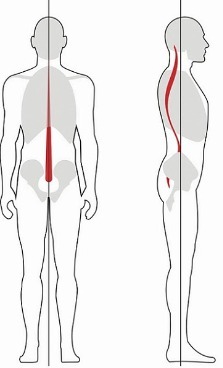 Upper cross syndrome may start as faulty posture, but left uncorrected it becomes the source of disabling pain. Fortunately, quality chiropractic treatment can help. The chiropractic approach is to restore the normal joint mobility as much as possible. It also seeks to re-balance the faulty muscles that produce the syndrome in the beginning. If you are suffering from neck, arm, shoulder or hand pain, it could be due to an upper cross syndrome. Dr. Martin Schmaltz has helped many people suffering from the effects of upper cross syndrome. You owe it to yourself to call him at (314) 731-4383 and schedule an appointment to find out if your pain is due to upper cross syndrome.